I'm back on the Southern Ridge Trading Company blog today to share some more inspiration for our current monthly challenge. You can find out all about our monthly challenge here. This month's challenge is about anything feminine, so with that in mind, I created a beautiful feminine Happy Birthday card. Lets get started on how you can create my feminine birthday card at home. To start, you will need to trim two patterned pieces of paper, one to 3 7/8" x 8 7/8" and the second to 3 3/4" x 8 3/4". 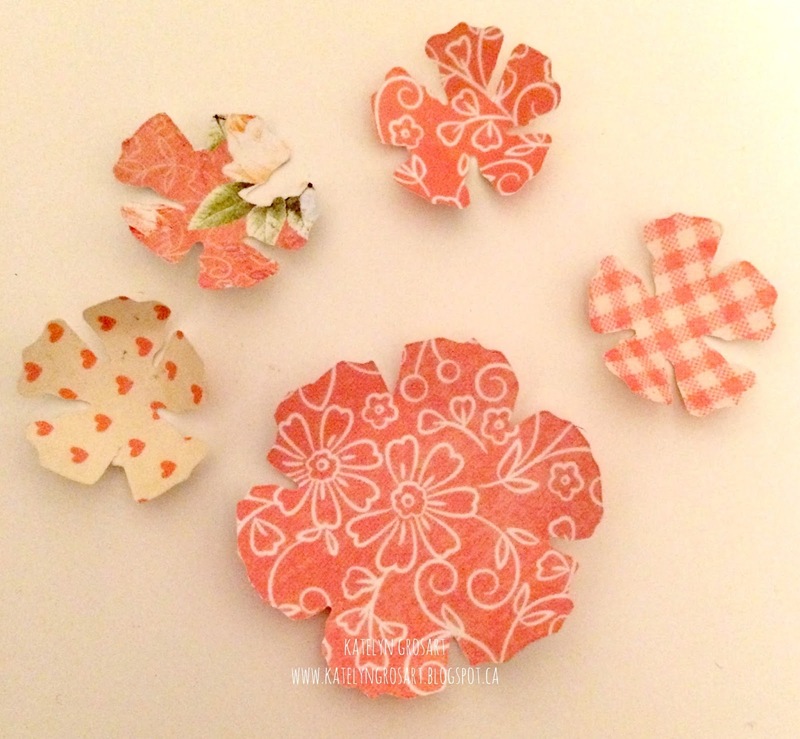 Once the patterned paper is cut, you will need the smaller piece as that is the one that you will be working on. On the smaller piece, apply a thin layer of white gesso starting on the right hand side of the paper and spreading it in the middle to the left hand side. You will want to leave a 1" from the bottom and top free of gesso as well as 1/2" from the left hand side. 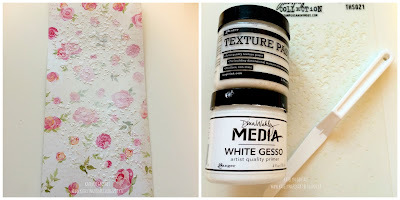 After the gesso has dried, using the speckles stencil, apply a thin layer of texture paste through the stencil at the top and bottom of the patterned piece of paper. You don't have to worry about having the stenciled image in the middle as it will be covered. With the patterned paper base complete, it's time to move on to the chipboard pieces. The first chipboard piece you will work on is the Honeycomb Pattern. Cut two pieces from the 6x6 square, one will measure 1 3/4" x 2 3/4" and the second one will measure 1 3/4" x 2 1/2". 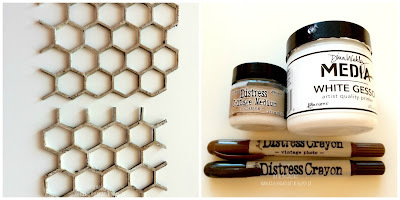 Once the honeycomb pieces are cut, apply two layers of white gesso to them. After the gesso has dried on the honeycomb pieces, apply a generous layer of Distress Collage Medium - Crazing. Once the crazing is on, it will take a bit of time to dry. After the pieces have dried from the crazing, using the Vintage Photo and Walnut Stain Distress Crayons, rub a layer of each colour onto the honeycomb pieces with your figure. 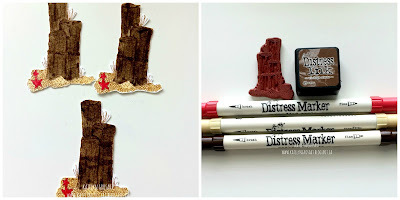 Using the distress crayons gives it an aged look and will highlight the crazing effect. The second chipboard piece is the Leafy Branches. You will need three leafy branches and they will need to be trimmed down to whatever length you desire as they will go around the flowers. 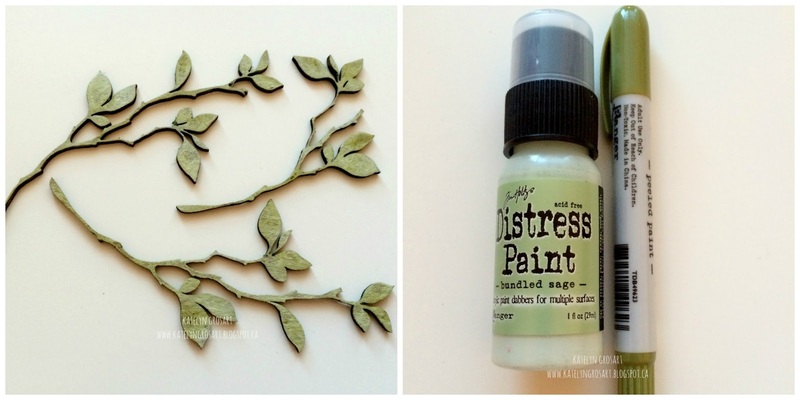 Once the branches are cut down, apply two layers of Bundled Sage Distress Paint to them and let dry. After the branches have dried, with your finger, rub a layer of Peeled Paint Distress Crayon over top of all three branches. The third chipboard piece you will use is the Vintage Oval Mirror Fancy. 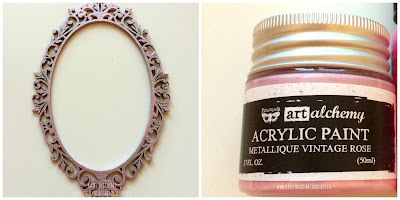 On the vintage oval mirror fancy, apply two layers of Vintage Rose Acrylic paint from Prima to it. Set aside to dry. The last chipboard piece you will use for the card is the "Wishing you Everything Wonderful" Wood Tag. 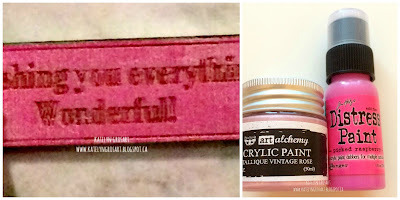 To start, you will need to apply a layer of Picked Raspberry Distress Paint to the entire tag. Once the paint has dried, add a layer of the Vintage Rose Acrylic Paint. Before the vintage rose paint layer completely dries, take a paper towel with a bit of hand sanitizer on it and rub off a bit of the vintage rose layer. This will give the tag a bit of sparkle. For the finishing touches of your card, you will want to add a doily to middle of the card, so that it covers where the two honeycomb pieces meet. Once the oval is adhered, dimensionalize the saying in the middle and add flowers to the left of it as well as around the top and bottom of the oval. Use a variety of flowers in pink, white and peach to compliment the paper. For the edges of the patterned paper, edge distress them and then ink the edges with Vintage Photo Distress Ink. It's all about Summer on the Emerald Creek Dares blog for this weeks two week challenge. For this challenge I focused on the ocean aspect of summer. With growing up on the west coast of Canada I was spoiled to be able to go and relax by the ocean. So, for my project I decided that I would create a ocean inspired happy birthday card. Lets get started as I show you how you can create my ocean birthday card at home. To start you will need to cut a 4" x 5 1/4" piece out of 100lb white cardstock. 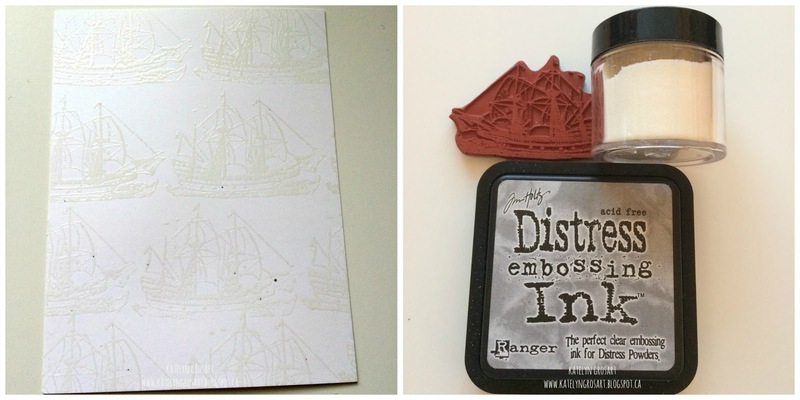 Once the cardstock is cut, apply Distress Embossing Ink to the Mayflower stamp. Stamp the ship starting at the top of the white piece of cardstock. Continue applying ink to the ship and stamping it onto the white cardstock piece until the entire piece is covered in ships. After the white cardstock is covered in ships, sprinkle Fine Clear Embossing powder over top of the entire piece, tap off the excess and then emboss with a heat tool. After the ships have been embossed, it's time to blend Broken China, Tumbled Glass, Mermaid Lagoon and Faded Jeans Distress Ink over top of the entire ship embossed piece of paper. 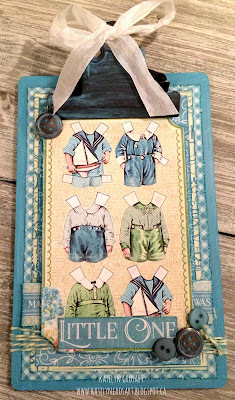 If the background turns out to blue for you, blend a bit of Vintage Photo Distress Ink over top to tone it down. To finish the custom background, edge distress the edges and then ink them with Vintage Photo Distress Ink. Now that the custom ship background piece is done, it's time to move on to the oval piece. For the oval you will need to use the Tim Holtz Stitched Ovals Dies from Sizzix and a small piece of 100lb white cardstock. Once the oval has been cut, blend Broken China, Tumbled Glass, Mermaid Lagoon and Faded Jeans Distress Ink over the entire oval. To finish the oval, edge distress the edges and then ink the edges with Vintage Photo Distress Ink. After the oval is coloured with the Distress Ink, it's time to work on the sentiment. 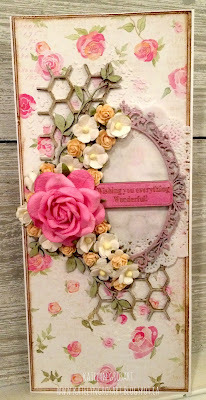 For the sentiment I used the Happy Birthday stamp and applied Vintage Photo Distress Ink to it. Once the stamp is inked, stamp onto a small piece of 100lb white cardstock. After it's been stamped, blend Broken China, Tumbled Glass, Mermaid Lagoon and Faded Jeans Distress Ink over the entire sentiment. When your happy with the coloured background on the sentiment, trim the Happy and the Birthday apart. 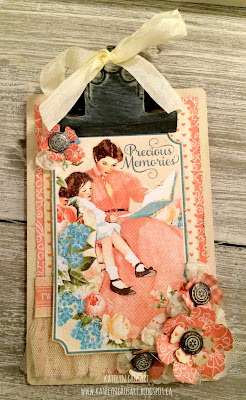 To finish the sentiment, edge distress the edges and then ink the edges with Vintage Photo Distress Ink. With the sentiment being done, it's time to move on to the Anchor Charm. 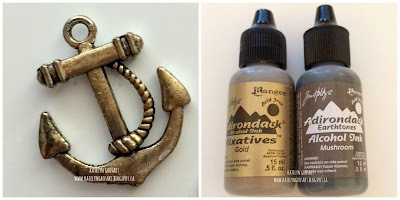 To get rid of the bright silver on the anchor charm, apply a layer of Gold Alcohol Adirondack Ink to it. Once the gold layer is dry, apply a layer of Mushroom Alcohol Adirondack Ink randomly over top of the gold. Set aside to dry. 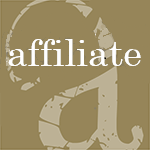 The next step is to work on the stamped images. The first stamped image is the Starfish. 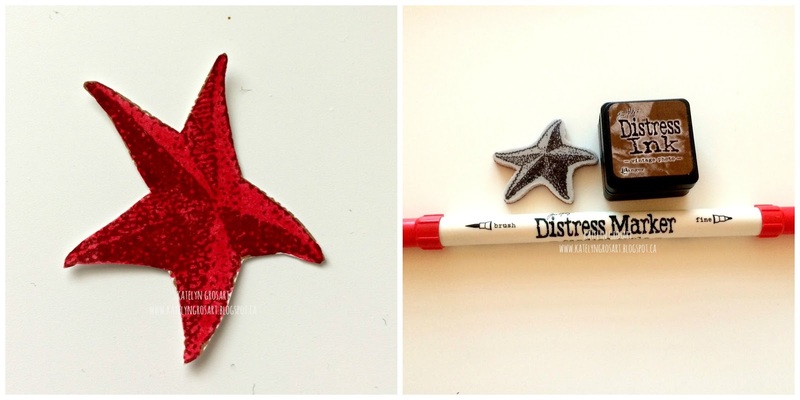 Apply Vintage Photo Distress Ink to the starfish and stamp on to the 100lb white cardstock. Once stamped, colour the starfish with the Candied Apple Distress Marker. Fussy cut out the starfish and then ink the edges with Vintage Photo Distress Ink. After the starfish is done, the next image that you will stamp is the Octopus. 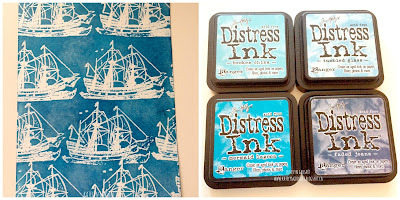 Apply Vintage Photo Distress Ink to the octopus stamp and stamp on to the 100lb white cardstock. 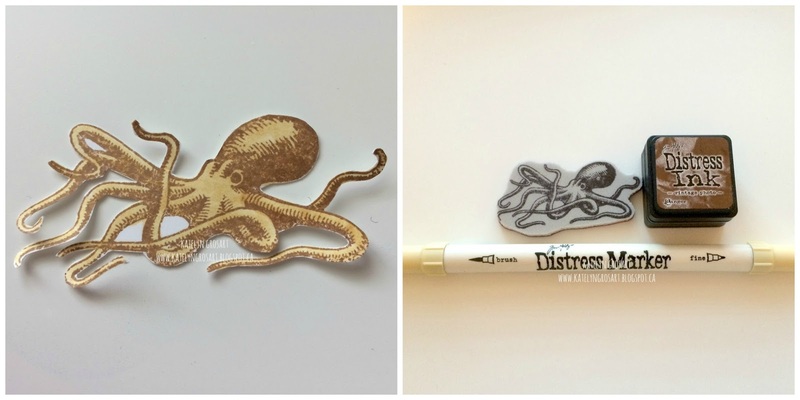 After the octopus has been stamped, colour the octopus with the Scattered Straw Distress Marker. Fussy cut out the octopus and then ink the edges with Vintage Photo Distress Ink. The last stamped image is the Water Logged. Apply Vintage Photo Distress Ink to the water logged stamp and stamp on to the 100lb white cardstock, repeat this step two more times. Once the water logged images are stamped, colour them with Gathered Twigs, Candied Apple and Scattered Straw Distress Marker. Fussy cut the water logged images out and then ink the edges with Vintage Photo Distress Ink. Once all of the images are cut, adhere them along with the sentiment to the oval. One of the finishing touches for my card, is wrapping linen twine around the middle of the boat custom background and then foam squaring the oval overtop in the middle of the background. 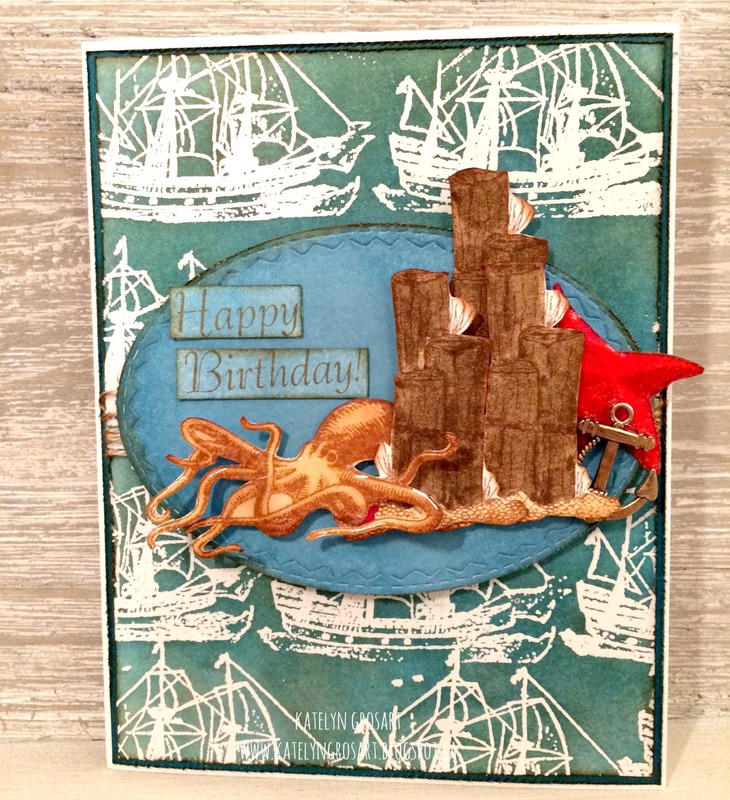 The second finishing touch is adding glossy accents to the starfish and octopus stamped images. The last finishing touch is adding a piece of teal cardstock to behind the ship custom background that measures 4 1/8" x 5 3/8", make sure to edge distress the edges and ink them with Vintage Photo Distress Ink. 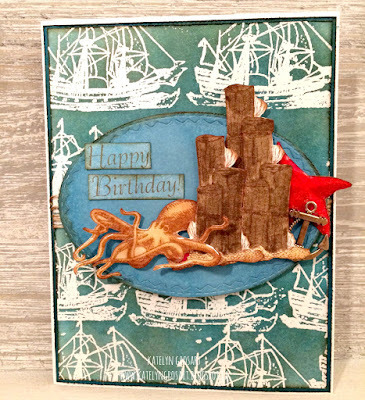 Thanks for stopping by and checking out my Ocean Happy Birthday Card. Don't forget to enter your project into our Emerald Creek Dares Challenge for your chance to win a $25.00 gift certificate for the Emerald Creek Store! 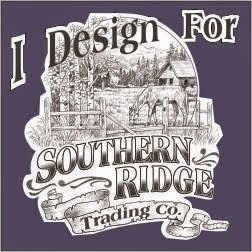 I'm back on the Southern Ridge Trading Company blog today featuring a canvas for my mom. Our Monthly challenge theme this month is anything feminine, so in light of Mother's Day being this month, I decided to create a canvas for my mom as I can't think of a better woman to celebrate who's in my life. Even though Mother's Day was on Sunday, why not celebrate your mom for the whole month of May! 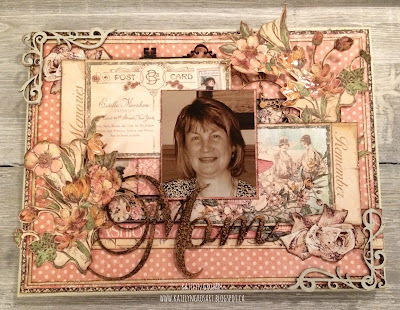 Sit back, relax and read all about how I created my "Mom" canvas. To start, you will need a 9"x12" canvas, I found mine at the dollar store. 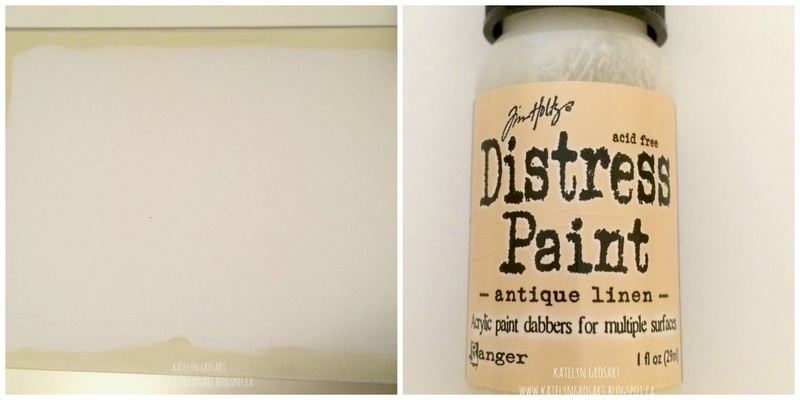 Once your canvas is unwrapped, apply Antique Linen Distress Paint 1/4" around the entire top of the canvas as well as completely covering all four sides. You will only need 1 coat of paint. Set canvas aside to dry. After the canvas has been painted, its time to move on to the chipboard pieces. The first chipboard piece you will work with is the Leafy Frame. You will need to cut the two corners apart where there isn't the leafy pieces and then trim off the excess plain chipboard so that all you are left with is the leafy part of the frame. You will need both corners. 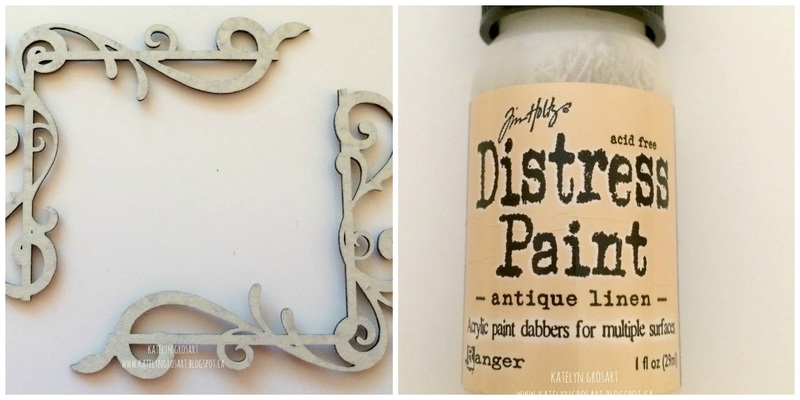 Once the corners are cut, apply two coats of Antique Linen Distress Paint on them. Set the corners aside to dry. 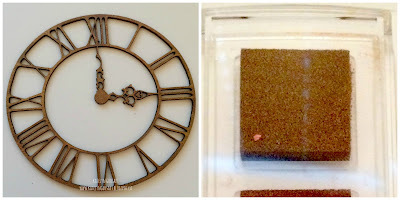 Now that the Leafy Frame is done, it's time to move on to the Vintage Clock. 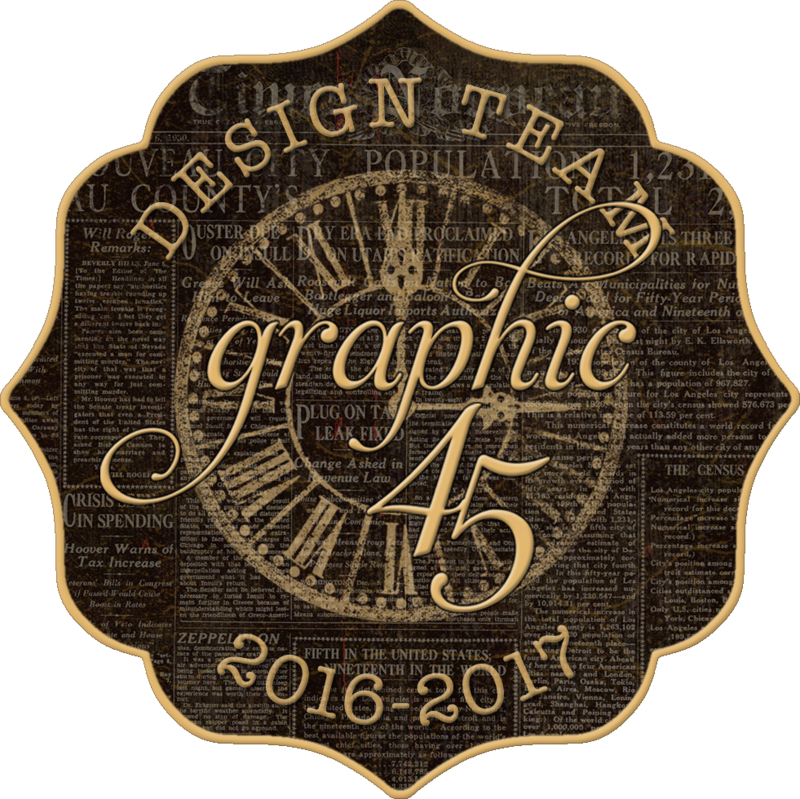 The vintage clock will get a layer of Celestial Copper Ink from Tsukineko's Delicata line. This ink takes a bit of time to dry, so you can heat it with your heat tool or just set it aside to dry. Now that the Vintage Clock is done, it's time to work on the Mother Word. 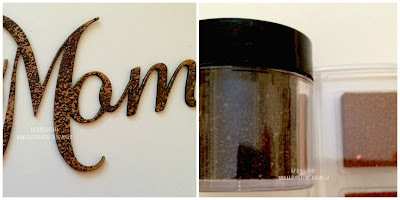 For the mother word, you will want to apply a layer of Celestial Copper Delicata over the entire word. Once the entire word is covered with ink, sprinkle Burnt Copper Leaves embossing powder over top of the entire word, tap off excess and emboss with a heat tool. 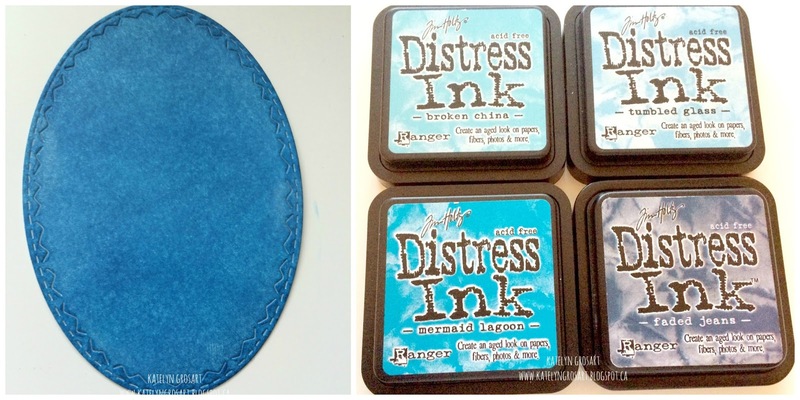 Because the Delicata is a slow drying ink, the embossing powder is able to stick to it. The last chipboard piece you need to cover is the key. 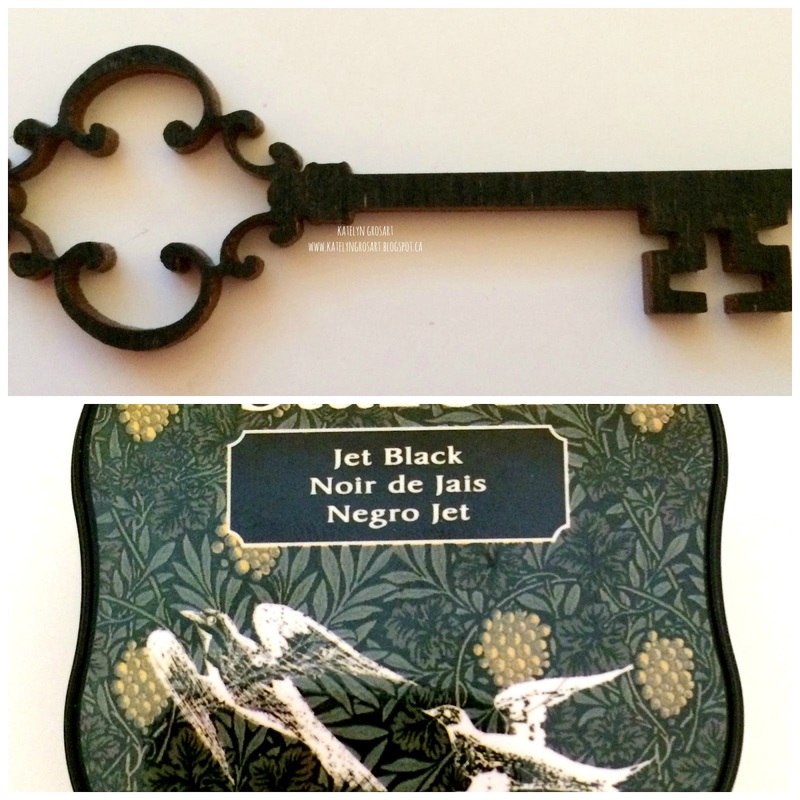 The key will get a layer of Jet Black Staz On. Set aside to dry. After the chipboard pieces are all decorated, you'll want to cut pieces of paper from Graphic 45's "Ladies Diary" Deluxe Collectors Edition pack to fit your canvas. The fussy cut images also come from the same set of papers. Before adhering the papers down, edge distress and ink the edges with Ground Espresso Distress Ink. After everything is adhered, add Glossy Accents to the flowers in the bottom left and top right hand corners. It's all about Babies, Buttons, Brads & Buckles on the Emerald Creek Dares blog for this weeks two week challenge. For this challenge I wanted to focus on the babies, buttons, and brads part as there seems to be a lot of babies born in the spring. So, for my project I decided that I would create a baby girl clipboard, which works easily as a home decor piece. Make sure to read through the entire post as there is a surprise at the bottom. Lets get started on how you can create my Baby Girl clipboard at home. To start, you will need to unscrew the top off so that you can gesso the clipboard base. Once the top of the clipboard is off, cover the edges of the clipboard surface with a layer of gesso. After the gesso dries, apply 3 coats of Antique Linen Distress Paint. 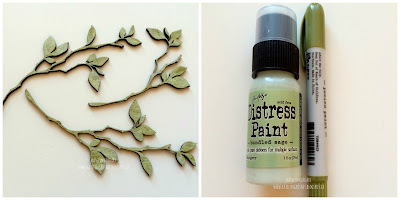 Because Distress paint is opaque, the more coats you apply the less of the gesso you will see. After your finished painting you clipboard base, it's time to move on to painting the clipboard piece. Apply a layer of Antique Linen Distress paint over the entire top of the clipboard and let it almost completely dry. While it is slightly wet, take a piece of paper towel with a bit of hand sanitizer on it and rub off some of the paint. 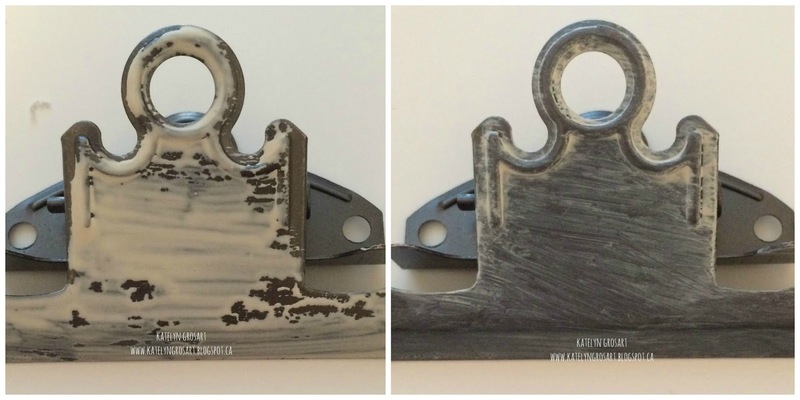 This gives it a slightly distressed look. 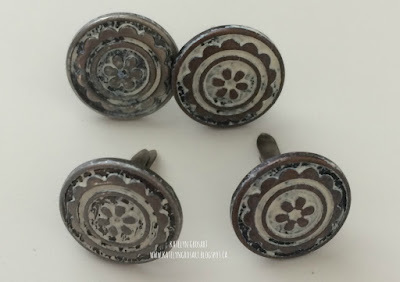 While your still working with the Antique Linen Distress Paint, you will want to cover the top of 4 Flower Wheel Brads with the Antique Linen Distress Paint. And then repeat the same steps as you did with the top of the clipboard. 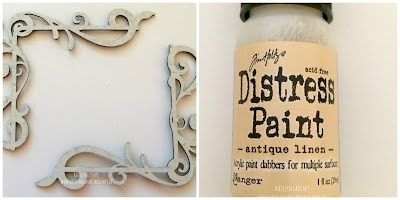 This is the last item that needs the Antique Linen Distress paint. To add some interest to your patterned paper, take a heart stencil and apply texture paste to give it a 3D look at the top left and bottom right hand corners. Once the texture paste is dry, with a blending tool apply a layer of Antique Linen Distress Ink over top of both heart stencil patches. This will get rid of the white from the texture paste. For the flowers, you will want to use the Tattered Florals Die from Tim Holtz and cut out a variety of patterned flowers. You will need to cut out 4 small ones and 1 medium sized one. After the flowers have been cut out, take your blending tool and Antique Linen Distress Ink and ink the edges of the flowers. 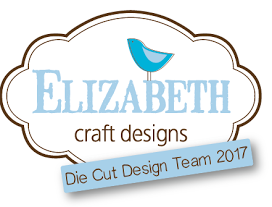 Once the edges have been inked, sprinkle Iridescent Embossing Powder on the edges and emboss with your heat tool. Some finishing touches that you will want to add to you clipboard is some cream tulle underneath the banner strip. Once the tulle and the top image have been adhered then you can start working on your flowers. Place a brad through one of the small flowers and then adhere it to the top left hand corner. Adhere a small flower to the middle of the medium flower and then place a brad through the centre of the small flower. Adhere the medium flower to the bottom right hand corner in the middle of the corner. For the remaining two small flowers add the last two brads to the middle of each flower and then adhere one to the left of the medium flower and adhere the other to the right of the medium flower. To add some extra detail, take some glossy accents and apply it to the centres of the blue flowers. To finish the clipboard off, add a cream bow to the top. Since I couldn't leave out the baby boys, I created a Baby Boy clipboard also. To create the clipboard, it's the same steps as the girls clipboard, the only difference is you will use Broken China Distress Paint and Ink as well as adding buttons and twines to the clipboard instead of tulle and flowers. Thanks for stopping by and checking out my Baby Girl Clipboard. Don't forget to enter your project into our Emerald Creek Dares Challenge for your chance to win a $25.00 gift certificate for the Emerald Creek Store!